India is the fastest growing economy this year and just finished a stellar increase of 14.3% in its exports in the month of July. If there is a bright spot in the whole world, it is India. While it is true that Western currencies such as the Euro and the British Pound are weakening against the dollar, it is primarily due to their exposure in Turkey. In other words, the world is worried about what would happen to European Banks that have lent billions to Turkey, should the Turkish Lira sink. India, on the other hand does not have any exposure in this. If anything the Rupee should hold its own against the Dollar or even appreciate a bit. Regardless of the Turkish Lira crisis, which just erupted a few days back, the Rupee has been weakening against the dollar all year, down by about 8.3%. Moody’s Investors Service’s external vulnerability index —the ratio of short-term debt, maturing long-term debt and non-resident deposits over one year calculated as a proportion of reserves — puts Indonesia at 51 percent and India at 74 percent. The reason India does so poorly is because Moody’s thinks that India has a foreign exchange reserves problem. What it is hinting, according to me, is that there is a trust deficit on the amount of India’s foreign exchange reserves. Since India is growing fast, I would expect the Reserve Bank of India to step in and shore up the Rupee. After all, they have $400 billion dollars in reserves and timely interventions will send the message out to the world that India is the go-to place for Manufacturing (now that China and US are at loggerheads with each other). In summary, I think there are other factors at play – to eliminate any suspicion of Currency markets rigging, the Securities Exchange Board of India (SEBI) needs to come out and state whether the allegations of the whistleblower Ken Fong are true and if so how this has been rectified. It is already close to 18 months and this should have been addressed a long time ago. Secondly, the truth of the exposure to loans such as the ones given to Nirav Modi by the Punjab National Bank (PNB) should be completely documented bank-wise and shared with the public. How many Letters of Intent were issued bypassing the Core Banking System? The Non Performing Assets problem is of the previous regime and you should not have to bear the yoke of this challenge all alone. Come clean and tell the truth. The people understand and repose their faith in you. Sooner or later, there has to be a catharsis. It is best that you let the public know the real state of India’s banks. Thank you for always posting such revealing articles(Team Purus).Keep up,although late but action will be followed. Indian rupee seems to have resisted a tour that some other currencies could not. Global factors have affected rupee. There is no doubt about that. I am surprised by the tone of this article. NOT all things are transparent in Modi govt. Yes there are strong non-performing finance issues especially when you have a lawyer as finance minister i.e. Arun Jaitely. He should go & bring in Dr. Subramaniam Swamy to guide India. Abolish income tax & raise the GST slabs. Remove & dismantle the income tax deparment once for all. The hindu astrology clearly specifies that having NINE ministries or maximum 12 ministries is enough – one each per planet or one per each bhava/house. Ketu – spying on enemies. 1. Are we earning enough through our exports? 2. Is our import bill rising? 3. Is enough FDI/FII investment coming into India? I presume the NRI remittances would be stable. 4. Are the wealthy Indians remitting money abroad? Are foreign investors pulling money out of the Indian market? 5. Do “people who matter” believe that Indian economy will do well in the near future? 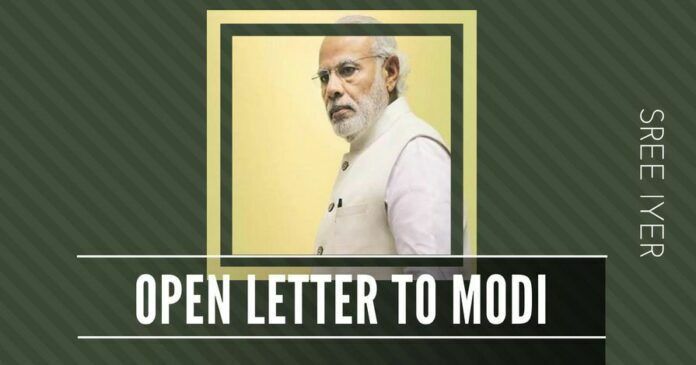 I welcome the letter of Mr. Iyer on behalf of intellectuals from public to point out real facts and directly to PM who is in the helm of affairs of this country.It gives him insight of the problem prevailing in today and how to rectify and overcome the situation. Every individual has their own drawbacks and self interest which prevails over common interest of the nation. Mr. PM in his own interest has to take bold step at this juncture instead of worrying for the criticism of the opposition as well as with in for the mjority of the Indians who had pinned their hope on his administration..